Usually for my birthday every year, I treat myself to a (solo) shopping trip. Some years I've been more extravagant than others, but this time I really just wanted to try some new beauty products I've had my eyes on for awhile. 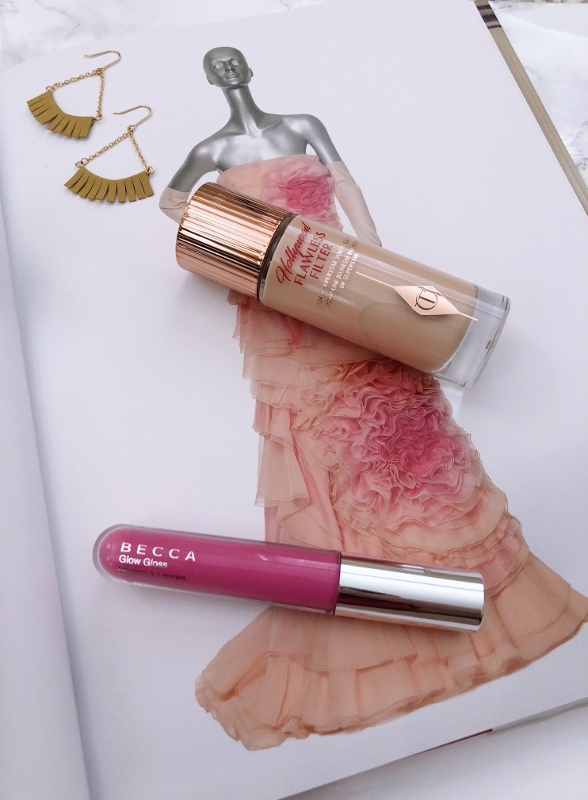 I've only used these a handful of times so I can't give full reviews just yet, but I will say wholeheartedly that the Becca lip glow in Camellia is the perfect cool-toned pink. I bought it a couple months ago but figured I should mention it here. I wore it the entire time I was in Mexico, and I still can't put it down! It's smooth, non-sticky, and smells like peppermint for an added bonus. I'm thinking of getting another darker shade for Fall/Winter since I love switching up my routine a bit each season. I have fairly oily skin after coming off the pill, so I've been going back and forth on the Charlotte Tilbury flawless filter. Everytime a beauty blogger raved about it, I wanted to give it a shot too regardless of it being very "glowy." I've used it on my cheekbones to highlight and I absolutely love the incandescent effect. I'm going to try mixing some in with my Make Up For Ever foundation and see how it wears, or whether or not it's too glowy for me. I'll report back! I thought these trendy facial rollers were just a gimmick, and maybe they are to a certain extent. However, I absolutely love using this at night after I've cleansed my face and in conjunction with my favorite serum. It feels so soothing after a long day! 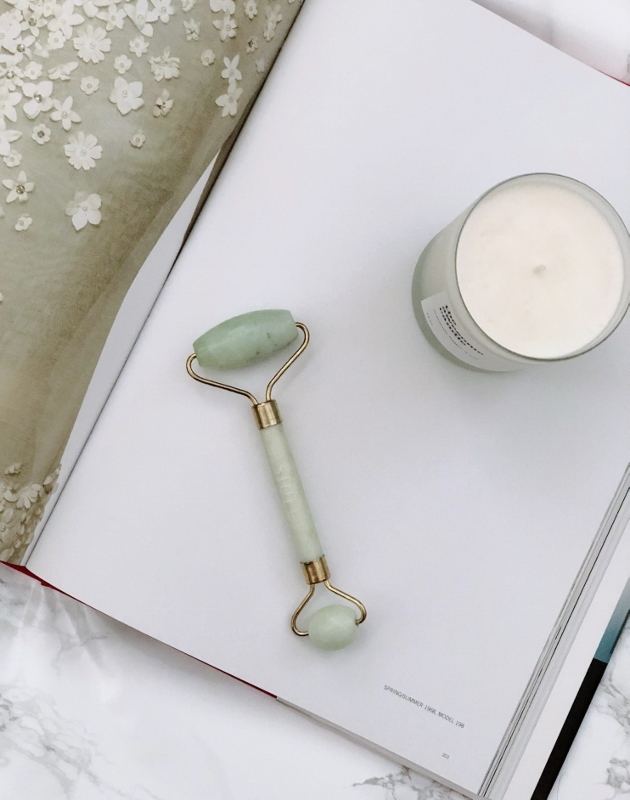 Facial rollers promote circulation and help products absorb deeply into the skin. So yes, it does sound gimmicky and yes, I would buy it again. Tip: Stick it in your fridge for a relaxing cooling effect. It feels amazing! I've seen great reviews for Sol de Janeiro products. 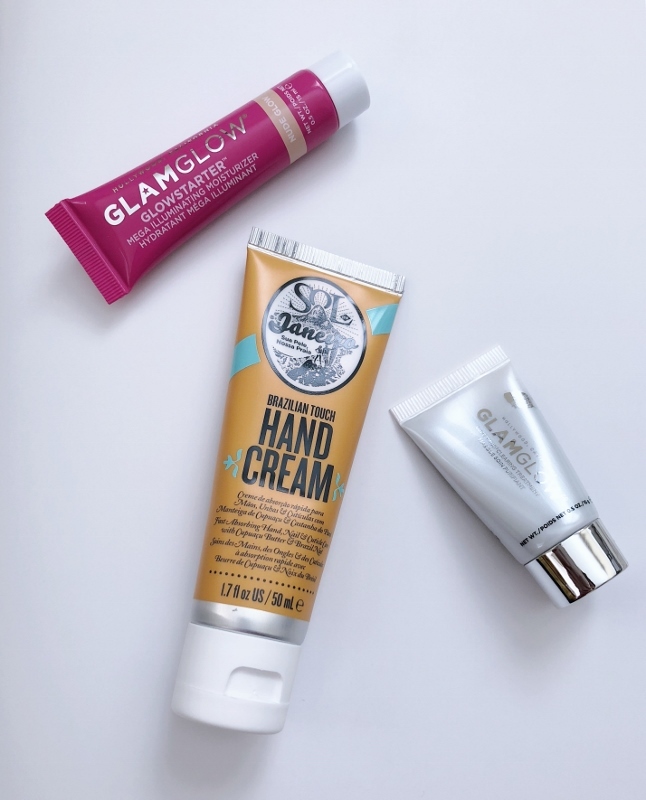 Now that the weather is getting really dry here, I need all the hand cream I can get! This one smells like a tropical island getaway and isn't greasy. So far, so good. The glam glow products are part of the Sephora VIB birthday gift. I haven't tried them yet but they also get great reviews. I'd forgotten about my jade roller! Reading this post reminded me! I love how it feels after a long day. It's so relaxing! Isn’t it the best?! I used mine last night and I’m fighting a cold so it felt great on my cheeks and sinus area, I’m glad you like it too! Thank you Gina, that means a lot! I think the idea of treating yourself to a solo shopping trip is a wonderful way to spend your birthday. I think we can tend to get caught up in others opinions when we shop with friends. I do love that shade of pink, it's gorgeous!